While preparing soft boiled eggs, I tested a variety of methods (including cooking the eggs in boiling water as the name suggests, bringing the water up to temperature while the eggs are in the water, holding the water at 150°F until the eggs are cooked, and steeping in just boiling water) in pots of different sizes. After deciding on the steeping method, I reran time tests to determine the best steeping time for a just peelable soft boiled egg. Here's the various stages of soft boiled eggs so you can choose the time that gives you the results you prefer. Using the method described in Recipe File: Soft Boiled Eggs where the water is brought to a boil, pot moved off the heat source, refrigerated large eggs placed into the water, lid replaced, and eggs shocked in ice water after a set duration of time, I tested various amounts of time spent in the just boiling water. 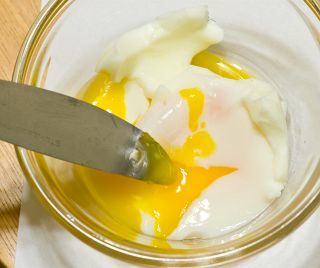 After 2 minutes: The thin albumen (egg white closest to the shell) has turned white and is semi-solid but the thick albumen (egg white layer nearest to the yolk) is still clear and liquid. After 3 minutes: The thin albumen has solidified. The thick albumen is liquid but turning white. After 4 minutes: The thin albumen has fully solidified. The thick albumen is semi-solid. After 5 minutes: The whites are solid, but when tilted they still flow. After 6 minutes: The whites are solid but not stiff (moves a little when the egg is tilted). The yolk has begun to thicken, but the egg still can't be peeled intact. After 7 minutes: The whites are solid but not stiff. The yolk has thickened but flows well. After 8 minutes: The whites are solid. The yolk has thickened and parts are beginning to no longer flow. After 9 minutes: The whites are solid. Half the yolk has gelled (solid but still translucent - not yet the opaque yellow of a hard boiled egg) and half continues to thickly flow. Does it not matter the size of the eggs? Just repeat the test using the same procedure you've established on small and jumbo. Plot size (probably mass, but volume should work too) versus time and then interpolate/extrapolate to figure out the time you should use for the sizes you don't test. I mean, it probably isn't a straight line given the fact that you have an egg cruising up in temperature to meet the water which is cooling down along a similar curve, and Newton's law of cooling implies that the curve supposed to be exponential, but it's shouldn't be too bad. What's the mass ratio between jumbo and the smallest size you're interested in? As long as it isn't 10 or so, I wouldn't worry about it. If it is, throw in one more size in between. So wouldn't the amount of water in the pan along with the number of eggs contribute to the timing? A large amount would be more stable. Maybe an amount or water per egg would be the way to specify it. What about the fridge internal temp? Or is somewhere around 38 fine? It would be interesting to weigh various egg sizes from various sources to see if there is much variation. Are the shells on brown eggs thicker? They seem to be for the ones I get and wouldn't that effect the timing as well? In my experience, brown eggs to have stronger thicker shells, but not significantly where it would affect temperature rise in the yolk and albumen. Fridge temps should be fairly standard==about 35 to 37F. A couple of degrees should not make that much difference since the rate of heat absorption is greatest at the start of the heating cycle where the difference in temperature between the egg and water is the greatest. Has anyone actually ever SEEN peewee eggs in a market? I don't even see small where I am on Long Island. Medium is the smallest I ever see here. I wonder how much elevation would matter -- would you need to do it longer at higher elevations? Elevation would definitely make a difference since the temperature of the boiling water is lower than if you were at sea level. At 1,000 to 2,000 feet, the difference is small enough that you might not have to make adjustments but over 5,000 feet (where the water temperature is about 10 degrees F lower) you might need to add a minute or two. Is that for a "runny" soft boiled or a "slowly flowing" soft boiled. There is less than a 2 degree difference in egg temperature between perfection and failure. scroll down 1-2 pages and you'll see. it's NASA - if they miss the moon by two degrees they'd just wave goodbye and hire a couple new astronauts . . . I'm glad Liv asked about altitude. At 5,000 feet it does take me a little longer to achieve the same results. ......re-running the test using freshly laid eggs i.e. those still warm from the laying process. utter waste of time. you could list all the home cooks in USA who could ever get a warm egg in their hand on a few sheets of paper. it is correct that the air sack changes with freshness. but there are so few people that can "do fresh" at a point it could make any possible difference it's a moot point, imho. Subject: Have you tried Shirred Eggs? Crack an egg into a little souffle cup and add a spoonful of milk or cream. You can also put a little chopped ham, or fish, or veggies, or whatever in the bottom of the cup. Set the cups into a baking dish filled with warm water. Bake at 375 deg until firm, 10-12 min; top with some cheese for the last 5 min if you like. It makes a very soft and creamy egg. Love the experimentation. As a researcher, I really appreciate the rigorous methods. I've always put a cold egg into water and brought the water to a boil. It's what I've always done, but is a pretty poor method, since I am not patient enough to sit by the pot to start timing once the water has come to a boil. As a result, I usually end up with undercooked soft-boiled eggs. I am going to switch up my approach. I'm not sure why I didn't just try a different method to begin with. I guess old habits die hard. why would you want the soft-boiled eggs to be peelable whole? seems like a whole lot of work, unless you do it sous vide. to be peelable, the white would be too firm to be really tasty. loses the gooey factor. I usually just spoon them out into a bowl. if i wanted whole soft eggs, i would choose to poach them. probably little offense sensed - but actually I think the "purpose" of the whole effort was to define/identify what temperature(s) produce what effect(s). soft boiled egg? what's with the "peel" thing? so past the "it's running all over the place" the temp guidance would be beneficial. oh well, i suppose it would be a pretty presentation in a hotel if you wanted soft boiled eggs on toast. Well, here's a new method my wife from Belgium brings with her which works perfect everytime. Start with cold water fully coveringand cold eggs together in a covered pot. Bring them to a rapid boil and set them off the burner for 4 minutes 30 seconds (sea level). Rinse in cold water to reduce temperature and drain. Eggs do not crack and are perfect. I think some decimal places may have gone missing here? I wouldn't call a 1 lb egg small.. The weight of the eggs is per dozen. Will all of the above work with brown eggs? It looks like you quoted one of my posts. (Tue Aug 26, 2008 9:04 pm) Sorry for the confusion. There aren't any missing decimals. The ounces listed are PER DOZEN eggs of the given size. I suppose everyone knows, but I noticed that sometimes eggs peel well and sometimes the skin is dry between the shell and the egg. Once my eggs had cooked the appropriate length of time, I took the pot of boiling water and sat it in the sink. Then I ran cold water into the hot water until it stopped steaming. Then I drained the water and filled the pot with cold water. These eggs slid out of their shells. Is there an better method? 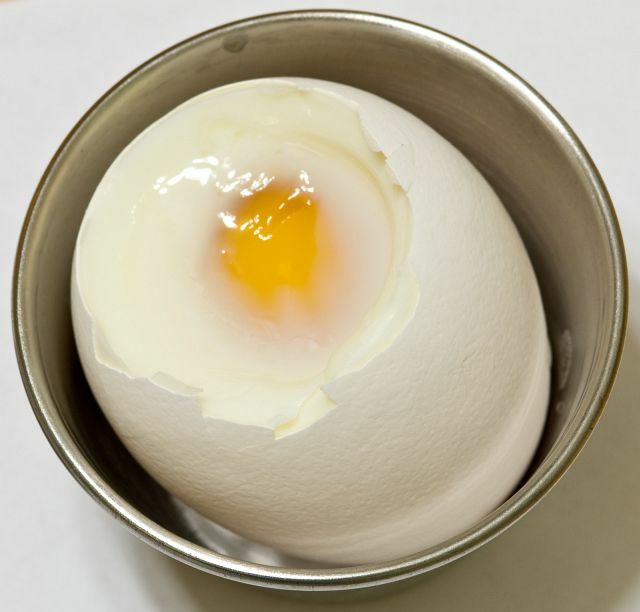 doing the perfect hard cooked egg - easy to peel, no green, etc - is a very long and twisted debate. I LOVE (yes, love in all caps) your experiment and write up. It renews my slightly battered faith in humanity's critical thinking abilities! 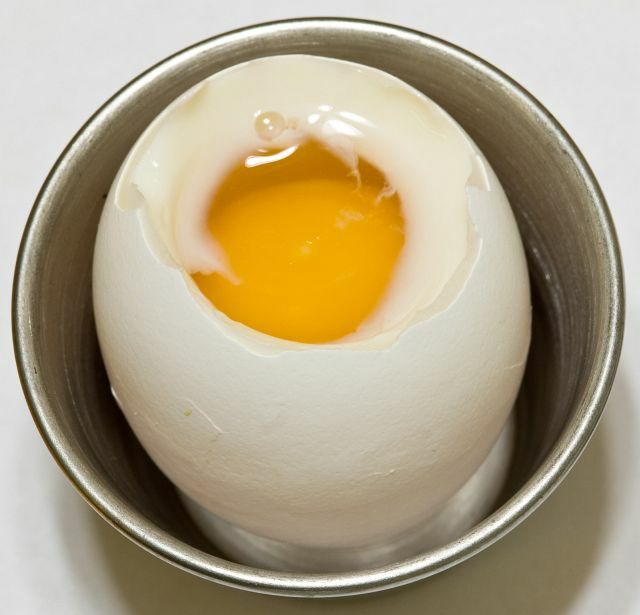 Boil 4 cups of water, pierce refrigerated egg w/egg piercer (or pin/needle) at narrow end of egg. 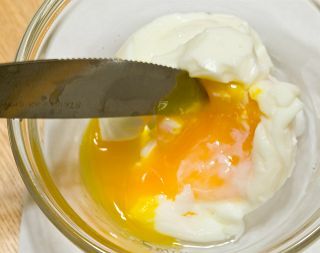 Use ladel or large spoon to carefully place egg into boiling water and boil for 4 exact minutes. Remove egg and place in cold water for 1 minute to stop the egg from cooking further. Remove from cold water and cut (with any steak or sharp knife) only 1/4 of shell at 1 end. Sprinkle w/dash of salt and/or pepper and use teaspoon to eat! I put any size eggs in as small a pot possible to fit the number of eggs and cold water to just cover. I add about 1/2 tsp of salt and turn the fire on high. I set the timer for 10 minutes. If I happen to notice that the water has started boiling, I turn the fire down so the boiling is less energetic - less chance of cracking. 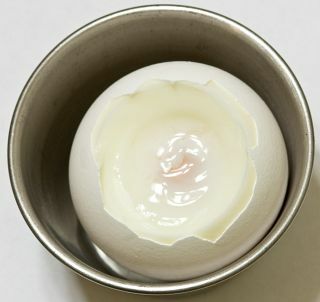 The eggs are always peelable soft: solid or nearly solid white, semi-solid yolk. Whether or not the membrane sticks has to do with freshness. The fresher the egg, the harder it is to peel cleanly. In "even easier", I forgot to mention that I cover the pot for all 10 minutes, and that I cool the eggs in ice water when the 10 minutes are up. The reason why a soft-boiled would require peeling: Often people eat their eggs, British-style, from an egg cup. Proper etiquette suggests tapping the egg (to crack the shell) and peeling a hole large enough to eat the egg from, using a teaspoon. Finger use is allowed. I believe there actually is a device for slicing the top off, but they are even harder to find than an egg cup. I am agreeing with this one. By using cold water you are enable to control the egg from breaking it. But I prefer hard boil than soft boiled. Subject: what about hard-boiled eggs that have been in the fridge? Does anyone have difficulty peeling eggs after they've been in the fridge for a few days -- or tips for avoiding these problems? I never have trouble with the ice-water plunge technique when I peel right after cooking, but after a few days in the fridge, the eggs stick furiously to the shells, and the peeled egg looks pretty ratty. 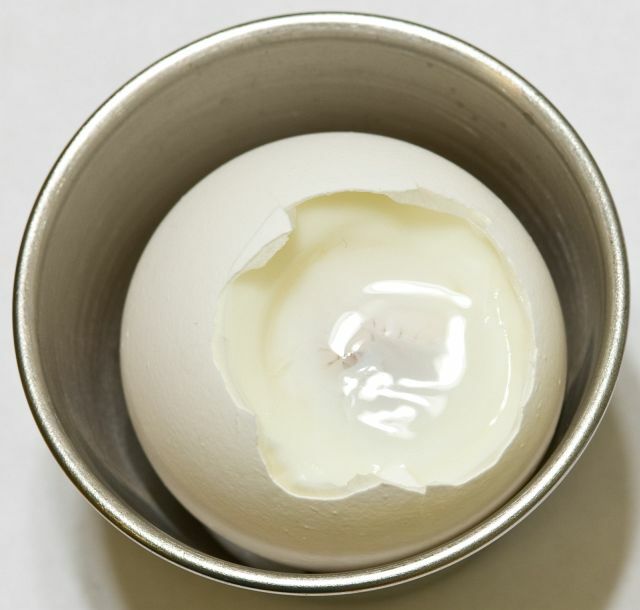 As a city chicken owner, the reason for difficult peeling of an egg is due to the freshness of the eggs. Store eggs are usually at least a week old, and eggs are not easily peelable until they are a week and a half old, uncooked. Some people find that a vinegar dip will "age" the membrane and make peeling easier. With fresh eggs (less than a week), peeling is a tedious task. As for cooking to a soft egg, try using an in pot egg timer. They are an acrylic resin "egg" that uses a color changing dye inside that is linked to temperature. You just place it in the pot with the eggs, and as temp inside the timer progresses inward you can simply see how far it's cooked. 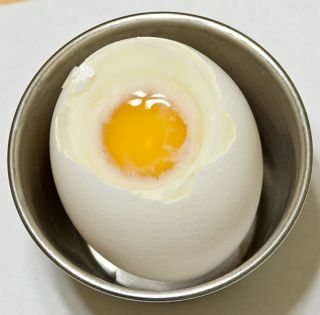 has anyone peeled a soft boiled egg and deep fried it for two minutes? If you ever tried to boil an egg soft, medium or hard you've probably slipped up more than once. What started out as a nice fresh raw egg often ends up overcooked. Sometimes to the point that the yolk is grey and rubbery. If that sounds familiar then the Egg-Perfect Egg Timer is for you. The Egg-Perfect Egg Timer is small, made of plastic and egg-shaped. It tells you when your eggs are soft, medium or hard-boiled by precisely sensing heat instead of time and this distinguishes this gadget from other egg timers. You place it at the bottom of the pot with your eggs and as the eggs cook the timer darkens towards the middle and when it reaches the right line for you, your eggs are done to perfection. It's one of those ideas that are so simple you wonder why it took so long for someone to think it up. Most people love boiled eggs but not when they're overcooked. Soft-boiled eggs always go down well with the children because they love to have them with toast soldiers. Dipping them into the hole at the top of their eggs and smothering them in warm creamy egg yolk. If you find getting your boiled eggs the way you want them hard for you then check out Egg-Perfect Egg Timer at www.eggsyourway.com They cost �4.97 each. if you insist on posting your spam every week you'll likely get your keyboard slapped. Since the advertisement seemed relevant and might actually help some people, I left the first one in... but I don't understand why they felt it necessary to post a second one. Let's see if next week we get another one - if so, even that first one is going to be treated as spam. Now that we know how to get a well cooked egg like we like them. (when things work right) Now does anyone know how to get the perfectly done steak to go with them? Any tips on how to peel soft-boiled eggs? uhmmm, very gently. a soft boiled egg is going to be gooey inside - we call them "gooey eggs"
depending on how 'soft' is soft, it could be quite a trick. why do you want to peel a soft boiled egg? I'm serious - I'm a big soft boiled egg on toast fan, what other goodies can I fix with them? 9 minutes? I'm not sure if you are on Mt. Everest, or talking about emu eggs, or need a new battery for your timer, but you are off your rocker. Such a well documented and photographed post, but please readers, do not waste your eggs. If you are looking for a softboiled egg ignore this guy. 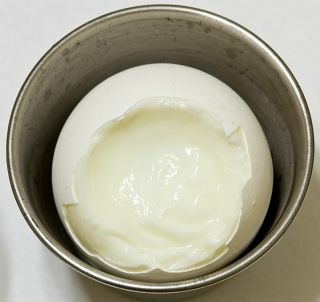 The reason for peeling a soft boiled egg is because some recipes call for it. I have a recipe for a Spring Salad with 4 minute soft boiled eggs that has you peel the egg and put the whole egg on top of the salad and the cut it open so the yolk runs down through the salad. So, I need tips on how to peel the soft boiled egg. This app for android is great. It takes into consideration egg size & temp, altitude, number of eggs & preferred doneness(word?). I highly recommend. Oh fercryinoutloud! An APP for boiling eggs? what if, in the time you are boiling the water, you preheat the egg in the microwave for 20-30 sec and then put it in the water? I little vinegar in the water seems to prevent the eggs from cracking. Don't know why? Why? - because a little vinegar / salt / baking soda / and the whole list of kitchen tale stuff . 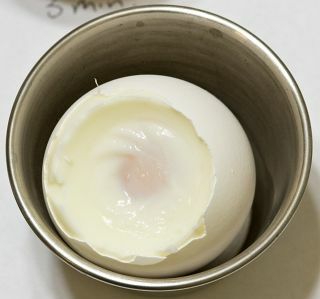 . .
Why does an egg crack when placed into hot water / boiled ? the air inside the egg expands. if the shell has been damaged - i.e. it's cracked already! - that internal pressure is enough to force out egg white before it sets. a little bit of acid in the water - vinegar / lemon juice / other - will make the oozing white coagulate faster and hopefully keep it from threading out into the pot water. 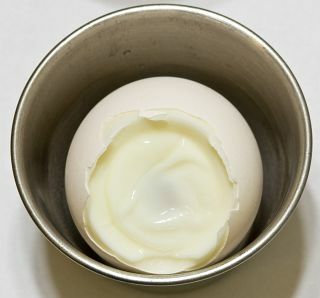 same "trick" is used for poaching eggs. I tried the seven minute method. I ended up with egg soup. Very disappointing. how cold was the egg? not all refrigerators hold the same temp . . .
how fresh / old was the egg? fresh egg white congeals at higher temps . . .
how fast does your pot lose heat? what was the ambient kitchen temperature? there are many variables. a "one size fits all and works for everyone" simply does not work. pick a method, experiment with the timing and take a note or two so you can do it again, reliably. we got a new refrigerator - I had to adjust my soft boil egg times. the new fridge keeps colder than the old one.